On my first trip through Vietnam, there wasn’t much variety of beer. There’s Bia Hanoi, Bia Saigon, 333, La Rue, and various local brews that tasted pretty much the same as those. When I arrived in Saigon in 2014, I found Hoa Vien, a Czech brewpub that was the first of its kind in Vietnam. The brewpub was near my apartment in District 1, but I found it rather deserted when I visited for a late dinner. Compared to most establishments in the embassy area, this was still expensive. When you’re used to spending less than $3 for a meal, $10 seems like a lot. Granted, the food was good and the dark lager was a welcome change from all the cheap beer I had drunk in Hanoi. The lack of other patrons sent me to find other bars after that. I tried going there once more during my month in Saigon, but it was a similar crowd and I decided to continue walking. Also, the little cafe that recently opened at the end of my alley began serving a similar dark lager for less. I did not return to either establishment on my return to Saigon in 2017, mostly because it was not a short walk from my hotel. I did, however, find new brewpubs and craft beer bars that opened up in the more touristy section of District 1, just a short walk from the backpacker street. I did, however, find Platinum (not to be confused with Platinum in Seoul) at the new tourist street food market near Ben Thanh Market, but the pale ale wasn’t anything special. Fortunately, it was significantly cheaper than the more attractive new breweries that have opened. On my first night I checked out East West Brewing and immediately walked out when I saw the prices at more than VND 200,000 per pint. Compare this to buying a bottle of Bia Saigon for VND 10,000 (50 cents) at a restaurant or convenience store. That first night, I ended up sitting outside at an alley restaurant with a couple bottles of Bia Saigon that only cost VND 8,000 each. After my stops in Mui Ne and Dalat, I decided to give East West Brewing and Pasteur Street Brewing a try as I realized I had plenty of leftover cash and little to spend it on during my last day in Vietnam. This was the most recommended brewery in Saigon, and I visited it before meeting a friend for dinner. It wasn’t the easiest bar to find as it was hidden down an alley with a small sign to indicate it. Then it was up the stairs to the bar for a taste of what they had to offer. I opted for the six taster glass set, but couldn’t order the acclaimed Cyclo Imperial Chocolate Stout because it was a significant amount more to add it to the group. I was already paying VND 250,000 +10% service fee (about $13) for those little glasses and wasn’t sure I wanted to splurge more on a taste of one more. Plus, the heat of Saigon doesn’t drive me to drink dark, heavy beers that may put me to sleep (and it was still quite early). My sampler included the Double IPA, Coffee Porter, Strawberry Soursop Hefeweizen, Spice Island Saison, Pomelo IPA, and Jasmine IPA. The layout and design of the bar reminded me a bit of Mikkeller Taipei. As it was before dinner, the bar was quiet and there were few customers. I imagine it gets more crowded than I saw. I probably would have enjoyed the atmosphere more had there been a few more people. They at least played some good music while I was there. The beer was better than expected, and I appreciated the local flavors added. The Jasmine IPA had a strong jasmine tea-like flavor that worked well with the hops and mellowed out the flavor at the end. I thought the Pomelo IPA was better as the pomelo isn’t as harsh as grapefruit, making this beer more mild and sweet to balance with the earthy hops. The Double IPA was also a worthwhile beer — a bit more complex than the others I tried. It had a fruity aroma to go with the mix of citrus and earthiness in the hops. It was sweet and bitter all at once. The most surprising were the Strawberry Soursop Hefeweizen and Spice Island Saison. I was concerned that the hefeweizen would be too sweet, but it was refreshing instead. The fruit could’ve been stronger to make it a better beer, but it was still an interesting one. My favorite, however, was the Spice Island Saison. This beer had amazing flavor with ginger, lemongrass, and pepper mixed with the sweetness of the heavy wheat. If I lived in Saigon, this would be my go-to beer. The only disappointment I had was the coffee porter. It had a great coffee aroma, but the flavor was more like coffee extract and it lacked a good porter base. Considering the tropical environment, I wasn’t expecting much out of a dark beer. After dinner and meeting with my friends along the busy streets of Saigon, I decided to try a little more beer before heading off to sleep. East West Brewing was about a block from my hotel at GK Central. I probably should’ve eaten more before having more beer as it definitely hit me harder than it should have. My light dinner was not filling enough for night of drinking. Just as I did at Pasteur Street, I opted for the four-beer sampler of Far East IPA, Coffee Vanilla Porter, Modern Belgian Blonde, and Summer Hefeweizen. It was only a little less expensive than the six I had earlier. East West Brewing looks more like a beer garden than a neighborhood bar–it was much too loud for the small crowd that I encountered. The high ceilings gave the place a cavernous feel. The entire bar felt out of place in Saigon. It’s a common problem with trendy new bars around the world — they want to look like the same establishments in the US and lack local appeal. The hefeweizen was light and refreshing and not too sweet, which made it more appealing than the other beers. It was a good introduction beer after walking in the heat. I found the Belgian blonde to be a sweeter version of the hefeweizen — there wasn’t a significant difference. The coffee vanilla porter was disappointing, but slightly better than the coffee beer at Pasteur. The vanilla overpowered the coffee. It’s not a beer I would recommend. The Far East IPA was nothing special, but a decent IPA. It tasted like an IPA should with nothing that differentiated it from others. It would be a worthwhile go-to beer if not for the price. Other than what I tried at Pasteur Street Brewing, I wasn’t impressed by the beer in Vietnam. And considering the price at Pasteur Street, I would be unlikely to go there often if I lived in Saigon. It’s a similar issue I encountered in Taiwan with high prices in a city with a low cost of living. It’s difficult to justify splurging on beer that costs as much as multiple meals. 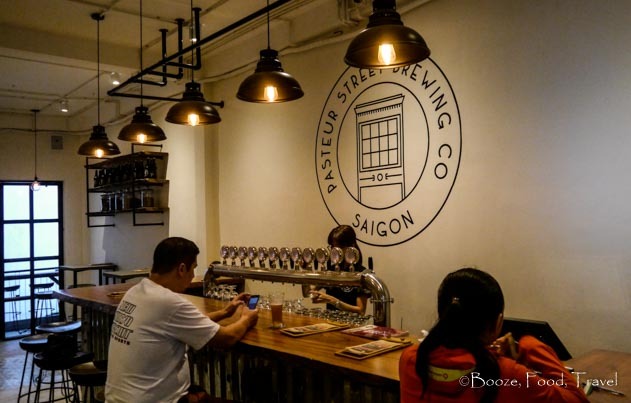 I would recommended having a taste at Pasteur Street to anyone visiting Saigon as it is a pleasant bar with good beer, but I wouldn’t push visitors to go out of their way for it. Have you tried craft beer in Vietnam? What did you think?